Participating in the practice of hot yoga is a challenge not only for the practitioner, but for the building owner who needs to control the humidity under the required temperatures. The ideal climate for a hot yoga studio is a temperature of 40.5 C (105 F) and 40 percent humidity. Keeping a healthy, mold-free environment with good IAQ is more of a challenge in some geographic locations than others. 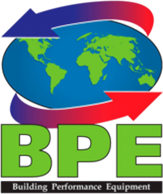 ERV Technology: BPE Raises the Bar! Many people think of energy-efficient savings first when planning to meet ENERGYSTAR®, LEED, or Passive House Institute standards and consider health benefits an added extra. However, as we said in a recent article on The International WELL Building Institute’s WELL Building Standard, buildings without superior ventilation contribute to sluggish performance, less astute thinking, and more sick days. Building Performance Equipment, Inc. welcomes the newest addition to its family of Energy Recovery Ventilators (ERVs)–and it’s a rather special little guy. Like its bigger brothers, the BPE-XE-MIR-200-i is an ultra-energy-efficient unit that sports a counter-flow heat exchanger design with less than 1% mixing of air streams. Ultra-as in 80% to 98% thermal efficiency with an Energy Efficiency Rating (EER) of 60 to 160. (Most ERVs in the industry typically come in at 45% to 65% thermal efficiency, rarely surpassing an EER of 10.) The new unit works much like the rest of the multi-patented line as it preconditions incoming air to room temperature. In other words, it efficiently recovers energy from stale air leaving the building and uses it to warm room temperature in colder months and cool it during the warmer months. In fact, BPE ERVs are so efficient that they, depending on the situation, can actually reduce or eliminate the need for supplemental HVAC. That efficiency can also reduce energy bills and our impact on the environment. In fact, it is LEED approved and ideal for Passive House design as well as conventional. When school buildings choose clean energy retrofits, many of the benefits are obvious. Others not so much. Improved Indoor Air Quality does more than provide healthier learning environments: Public schools rely on average daily attendance rates to receive federal funding, so the potential for less student and staff sick days is important. might ignite the fastest, most powerful sprint toward a net-zero building stock. Passive energy practices cut back on energy use by 80%, ease harmful emissions, reduce reliance on the grid, save heaps of money, and offer the population far healthier indoor air quality (IAQ). When it comes to comfortable, healthy Indoor Air Quality, reliable HVAC solutions must compensate for increasingly tight building envelopes. The trend toward tighter envelopes is, no doubt, an important one. They are a must for keeping out moisture, condensation, and soil gases (i.e. radon) as well as reducing heat and air conditioning costs. However, a supply of fresh air coming into a space is vital if you, quite simply, want occupants to breathe. Further, you want them breathing healthy air. The tighter the envelope, the less fresh air makes it into the building naturally.